Students will enjoy Rainforest Sounds, going on a Note Safari, making a Journey Into Space, and more! 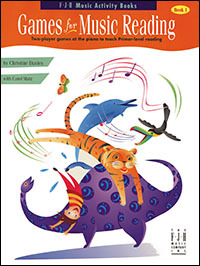 These imaginative games are designed to reinforce music reading skills in an entertaining and motivating way. All games are for two players: either student-student or teacher-student. Wonderfully illustrated and fun to color!